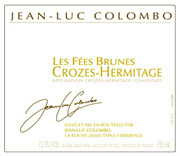 As I have mentioned in previous posts, I love the wines of Jean-Luc and think he produces some of the best wine in France. This wine comes from the Crozes-Hermitage region in the Northern sector of the Rhone Valley located on the left bank of the Rhone river. It's produced from 100% old vine Syrah sourced from a single vineyard planted on terraced granite slopes. The grapes are harvested by hand into small, shallow containers and vinified traditionally, undergoing a lengthy maceration in the process. The wine is aged 15 months in oak barrels ranging one and two years in age. This darkly colored wine has a bouquet laden with black plum, crushed rock, blackberry, raisin and hints of cinnamon. On the palate I get pretty distinct blackberry notes accompanied by touches of spice, and the reassurance of mineral/crushed rock nuances. This wine also has a plum skin character and a lot of dry real-fruit flavors. What I mean by that is it's not candied or overripe like a lot of other Syrah's I've recently tasted. What I don't like is the touch of heat on the finish and the absence of texture on the mid-palate. It's not a bad effort, but not entirely what I was expecting from a single vineyard Syrah from Colombo. For his better efforts make sure to seek out the Cornas wines.